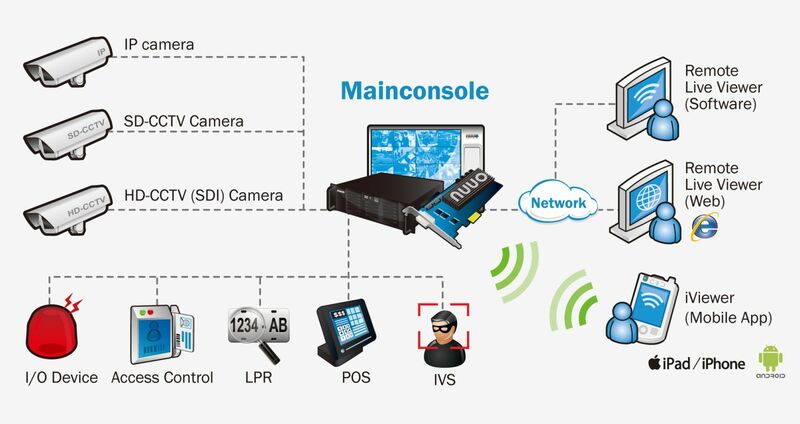 NUUO Mainconsole is the best choice when you have existing older analog systems but wants to upgrade to IP cams. It provides seamless integration between older and newer types of cameras. Mainconsole is also flexible. Choose from software + capture card option or software + capture card + certified hybrid machines to ensure optimum performance. The configuration option is limitless. Mainconsole (server) Mainconsole is NUUO PC based video recording server. It can display live video and configure the system. NUUO NVR has an intuitive design which can be learned very quickly. The main functions include the following: Stream multiple live videos from IP cameras and IP video servers Unique GUI recording schedule 6 event detections and 11 instant alarm responses (example, email alert and E-map popup) Duplicate channel display with digital PTZ NUUO Mainconsole can both display live video and configure the recorder. Playback system (client) NUUO playback system makes browsing records smarter and faster through our intelligent search. Save video recompresses the image into ASF/AVI format. Video enhancement tool can be used to sharpen, brighten or even grey scale the images. Varies logs make keeps a record of all the events. Backup system Easy to use multi-channel backup application for archiving audio and video locally or remotely. NUUO backup system can also take snap shots of the recordings and store it in a separate location. Remote Live Viewer (client) Remote live viewer client supports 64* channels per monitor and can view up to 128 cameras in dual monitor systems. Remote Live Viewer client can access and display live video from any NUUO Mainconsole family servers simultaneously. NUUO remote live viewer features PTZ control, E-map and I/O panel. Remote Playback system (client) NUUO remote playback system makes browsing records smarter and faster through our intelligent search. Save video recompresses the image into ASF/AVI format. Video enhancement tool can be used to sharpen, brighten or even grey scale the images. Varies logs make keeps a record of all the events. Remote Backup System Remote Backup application can be used to backup recording and its associated log file remotely from any of the NUUO Mainconsole family servers. Web / Mobile Viewer (client) • NUUO web client can both display live video (64* channel) and playback recordings (16 channel) on remote server. • i-Phone / i-Pad/ Android can stream video from NUUO Mainconsole servers. monitoring solution for grand scale projects and projects with multiple sites. video channels. All POS recordings are searchable. Appliance by providing the original, PTZ, quad, and perimeter modes. and the total bit rate of the IP cameras. Open Platform: Supports over 2100 models of IP cameras, megapixel cameras and video servers from 97 brands of network camera manufacturers; supports H.264, MPEG-4, MJPEG, MxPEG video formats; integrates various systems including point of sale (POS) and I/O devices, license plate recognition and access control system. SDK for access control integration available upon request. Multi-site/Multi-server: Each NVR server supports up to 96* channels, from IP cameras and video encoders with analog cameras, and can be managed by NUUO CMS or remote live view client for centralized management in multi-site projects. Disk Load Balance: NUUO NVR improves recording performance to utilize several disks and dynamically distributes the video loads among the disks to improve throughput. Multiple Video Clients: NUUO NVR server can stream video to multiple Remote Live Viewers, web clients and mobile clients simultaneously. Intelligent Video Analytics: NUUO IVS supports 6 types of video analytics including general motion, missing object, camera occlusion, foreign object, focus lost and signal lost. Each IVS alarm can trigger up to 11 unique instant notifications include push notificiation on mobile. Advanced Intelligent Video Surveillance: NUUO support counting filters including people counting, vehicle counting, stabilizer and tamper detect and 8 types of surveillance suite including presence, enter and exit, appear and disappear, dwell, tailgating, stopping, direction and tamper detect. Intelligent PTZ: Joystick support on PTZ cameras and software enabled digital PTZ function are both available in NUUO NVR. Preset points and patrol functions are also available on many camera models. GUI Recording Schedule: Intuitive GUI recording schedule featuring continuous recording, motion recording and the 6 unique event recording modes. Users can define the recording schedule for each camera on a day by day basis. Centralized Management in Multi-site Projects. Transcoding: Record and display live video at different frame rate and resolution. Boosting Recording: Dynamically boost recording quality on motion and other events to optimize recording storage. OnGuard (Software Watchdog): NUUO OnGuard brings NVR Server back from the unresponsive state such as a hang and neglects restore to normal operation. Failover Recording Server: Failover server can be on standby for a single or a group of Recording Servers. Automatic switch to on standby server upon the failure or abnormal termination of the Recording Server ensure continuous system availability. Advanced E-Map: Capability to import custom image file, place the cameras and I/O on the map to indicate where events are being triggered with a convenient video preview window. User-Friendly Interface: GUI recording schedule, camera drag and drop, I/O control menu and PTZ control menu. Automatic Camera Model Detection: Automatically search for all available IP cameras within the network (camera must support UPnP protocol). For cameras that don’t support UPnP, users can manually insert the IP camera. The auto detection function will help the user to find the brand and model of the camera after specifying its IP address. Counting Application: Intelligent 2-way (in and out) counting of object, people and traffic. User Authority Management: Support unlimited number of users with detailed and fully customizable user privilege on each user. Windows® Active Directory: Synchronized with Windows® Active Directory server to manage user privilege and control of camera action. Network Flow Monitor: Data streaming bandwidth of each remote client connection to the NVR server can be monitored and blocked if flow rate is too high. Auto Recycle: Automatically recycle recording files when the storage is full. Separate recycle schedule between recordings and varies log files. SDK Integration Support: Open SDK for integration with third-party systems such as access control, automation, burglar alarm, video analytics and others. Upgrade notification: Automatically obtain upgrade notification from NUUO website to download the latest version. Panorama PTZ Camera (360°)*: for 180° panoramic view (wall mount) or 360° surround view (ceiling/floor/table/mount) without blind spots. Multi-view: NUUO NVR can duplicate the same live view video onto multiple channels and digitally zone in to see the details of different spots on cloned channels without losing the original live view video. Monitor Resolution: Supports 1024x768, 1200x900, 1280x1024, 1366x768, 1440x900, 1600x1200, 1680x1050, 1920x1080, 1920x1200 screen resolutions. Advanced E-Map: Freedom to import custom image file, place the cameras and I/O on the map to indicate where events are getting triggered with a convenient video preview window. Bandwidth Monitor: Monitor and display the bandwidth usage of individual cameras and remote viewing clients. Two-way Audio: Listen and record audio from camera’s microphone. Talk to IP camera’s speaker. Instant Playback: Allow to play the last few minutes of any live video channel on MainConsole and Remote Live View. Privacy Mask: Protect privacy of the sensitive image by blocking out sensitive areas from view and covering the areas with black boxes in live, playback and exported video. Post-Recording Processing: Search for 5 types of different analytics events, digital PTZ and video enhancement tool are all available in playback. Multi-Channel Playback: Play up to 16 channels of recorded video simultaneously both locally and remotely. Forward playback at 1/16x, 1/8x, 1/4x, 1/2x, 1x, 2x, 4x, 8x, 16x, 32x, 64x. Video Enhancement: Fine tune the image’s visibility, sharpen, brightness, contrast or even grey scale. Intelligent Search: Search for 5 different special events (general motion, missing object, foreign object, camera occlusion and signal lost) in recorded files with date, time and log file. Video Export: Take a snapshot of the recording in JPEG/BMP format or export a section of the video in “AVI” and “ASF” format. Auto and Manual Backup: Schedule or manual backup the recording for archiving purposes or backup the recording with an embedded player to watch at a separate location. NVR supports both local and remote backup to local HD, CD, and DVD. Log data: Unusual event, system log, counting application, POS log and export and backup can export to“xls”or“txt”file. Watermark: Protect for original recording from alternation with our watermark verification tool. DBTool: Reconstruct, repair or relocate the recordings in local drive, or external drive. Multiple Live View Display: Streaming live video from multiple NUUO servers (NVR, DVR, and NDVR) simultaneously. Dual monitors support with up to 128 channels per monitor (64* channels per monitor). Multi Playback Channels Display: Remote playback of 16 channels recording from any one of the NUUO servers (NVR, DVR, and NDVR). I/O Event Control: Easy to use input and output control panel to remotely trigger digital outputs and monitor input status. E-Map: A map view of where each camera and I/O devices are located with a convenient preview window. Remote Backup: Backup the video into .DAT format with a NUUO player attached for easy achieve and viewing purposes. Mobile Client: Support iPhone, iPad and Android application client to live view video and control PTZ functions. Central Management System: Ultimate central monitoring solution for grand scale projects and projects with multiple sites. Fully compatible with NUUO Mainconsole family servers. Remote Desktop Service: Embedded remote desktop server that will host for any NUUO remote desktop clients to remotely configure the NVR software (remote desktop client is installed separately). Point of Sale (POS): NUUO Point of Sales system works on NUUO NVR by overlaying the transaction text from cash register onto live video channels. All POS recordings are searchable. External I/O Capacity: Support USB (SCB-C08) and Ethernet (SCB-C31A) converter. Please refer to our I/O box section: C24/C26/C28 for more details. Panomorph PTZ Camera (360°): Integrates ImmerVision Lens (IMV1-1/3 Lens supported) to view Live, record and playback the complete 360x180 FOV. Users can easy to detect, track and analyze throughout the entire area. Vivotek Fisheye Camera: Integrates Vivotek fisheye camera FE8171V equipped with a fisheye lens for 180° panoramic view (wall mount) or 360° surround view(ceiling/floor/table mount) without blind spots. 3rd Party Integration: Metadata Plugin technology support 3rd party software including license plate recognition, access control and so on. Though Metadata Plugin, users can manage metadata by recording real time information in databases which can describe events that link to video and audio. The system provides smart search tool to retrieve information and recorded video. *Micros will support VIT(LPR), Soyal and Falco (access control) and Dsotre (POS). Smart detection: Detect 6 camera events, 14 different user-defined POS events, digital input events and 4 system events. The combination of our smart guard events is a powerful tool to combat vandalism and provide a platform for operators to monitor and respond to live events immediately. Instant alarm notification is the fastest and most cost efficient way to automatically respond to any smart detection event. Video Resolution SCB-8004HD is HDcctv Compliance 1.0, and only support 1080p 30/25, 720p 60/50/30/25. Tzu Chi Hospital and Unive..